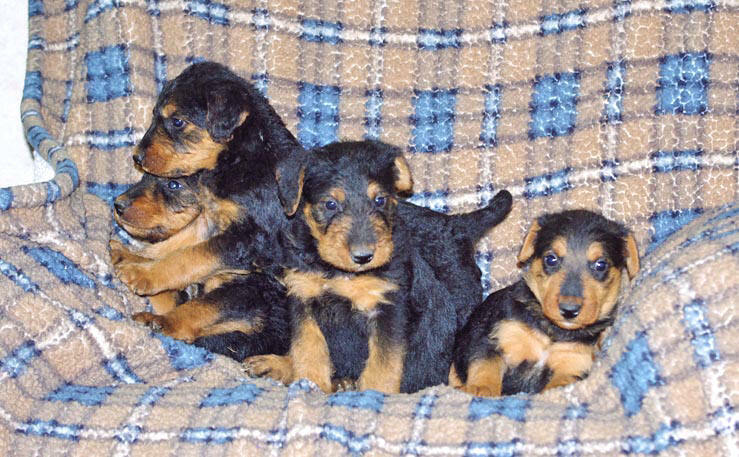 New AKC Litter of 8 black & tan puppies born on March 2, 2019 - Ready by April 27! The puppies' tails were docked and dew claws removed by our vet at an early age. Shots and dewormings are kept current. Shipping is available to most of the United States. Photos below of the pups were taken on April 14, 2019. 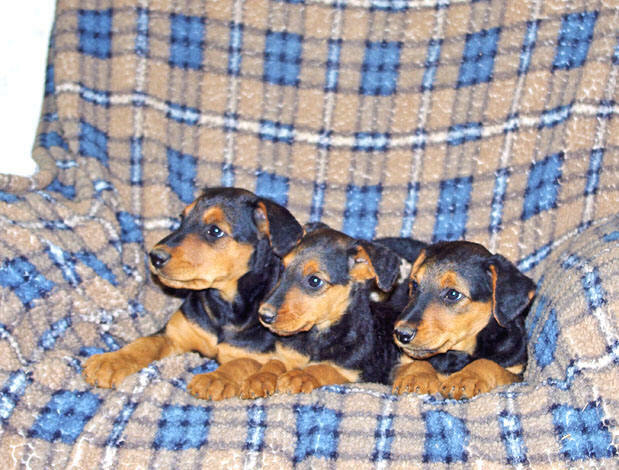 The large AKC parents are Lilly Belle and High Pockets. Possessing a cheerful disposition, Lilly weighs around 68 pounds and has a very easy to maintain coat. High Pockets weighs over 100 pounds and has a sweet and clowny personality. Photos of their father High Pockets are shown lower on this page. Please feel free to contact us at 307 754-3426 for more info. Thank you. 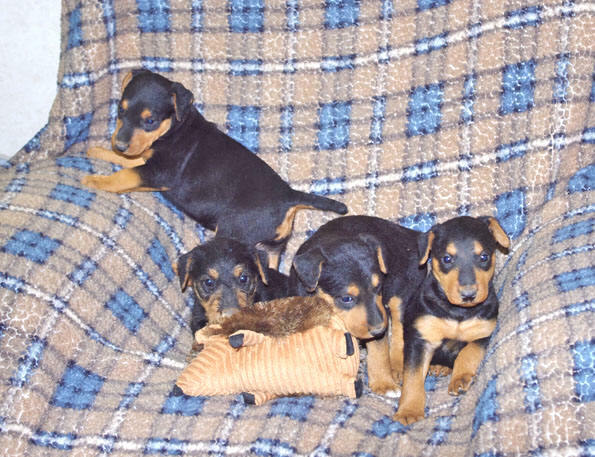 Litter with rare reds born on January 8, 2019 - Ready Now! Very playful and outgoing, two males are still available. The puppies' tails were docked and dew claws removed by our vet at an early age. Shots and dewormings are kept current. Both boys possess easy to maintain coats and very outgoing personalities. Shipping is available to most of the United States including Alaska. Photos below of the boys taken on April 13, 2019. 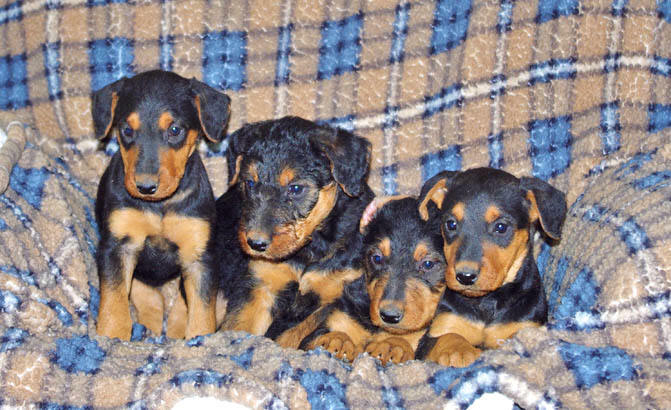 The large parents are Junebug (black & tan) and Rebel (red) who weigh between 60-70 pounds. Both are quite outgoing and Rebel possesses a very sweet and mellow disposition. Please feel free to contact us at 307 754-3426 for more info. Thank you. Photos of Gator playing on the snow drifts during winter of 2017. Photos above of Fancy Girl (left) and Tonka (right). 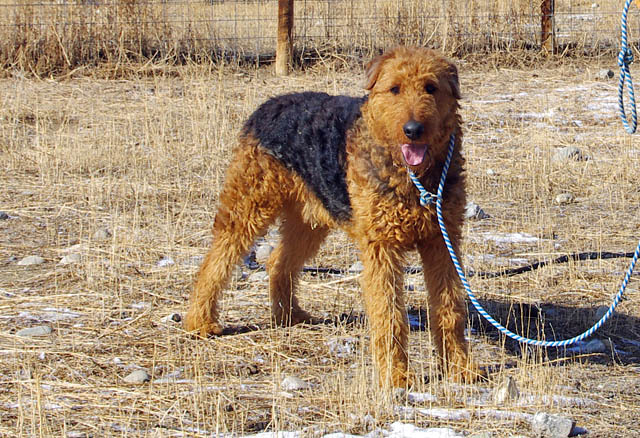 Cheerful and playful Tonka, rare red Airedale, stands about 29 inches tall at the shoulder and weighs around 90 pounds. Exhibiting a happy go-lucky personality, he is also Fancy's grandson. He has a very easy to maintain coat and has never been trimmed! Fancy weighed 80 pounds in her prime. Sadly, she crossed over the Rainbow Bridge in 2012 at nearly 14 years old. A great housepet and wonderful dog, she is missed tremendously. 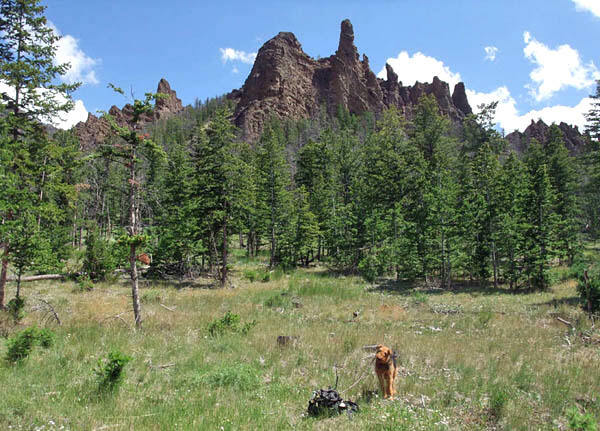 High Kountry Airedales is located in northwestern Wyoming at about 25 miles east of Cody and 75 miles east of Yellowstone National Park. 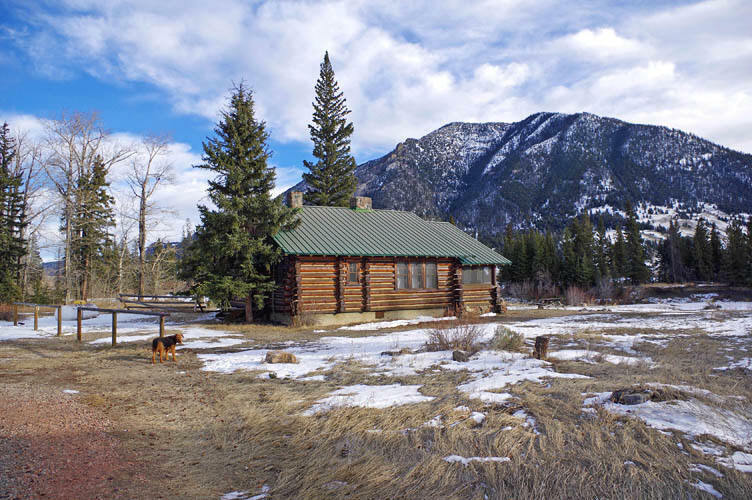 Established in 1872, Yellowstone is the first and oldest national park in the U.S. We are also situated about 40 miles east of Shoshone National Forest, the first national forest established in the U.S. Our kennel is maintained at our rural residence. Kennel visits are welcome and so are questions. Our kennel is a serious hobby for us and we love our dogs. Females are only bred once a year sometimes less often. We breed selectively for temperament and other attributes. Quite playful, our dogs exercise and frolic several times a day in the large dog runs which range from about 80 x 150 feet to 120 x 200 feet in size. Plastic wading pools are available for the dogs to frolic in during the summer months. Quite a few of our Airedales love to play in the water. 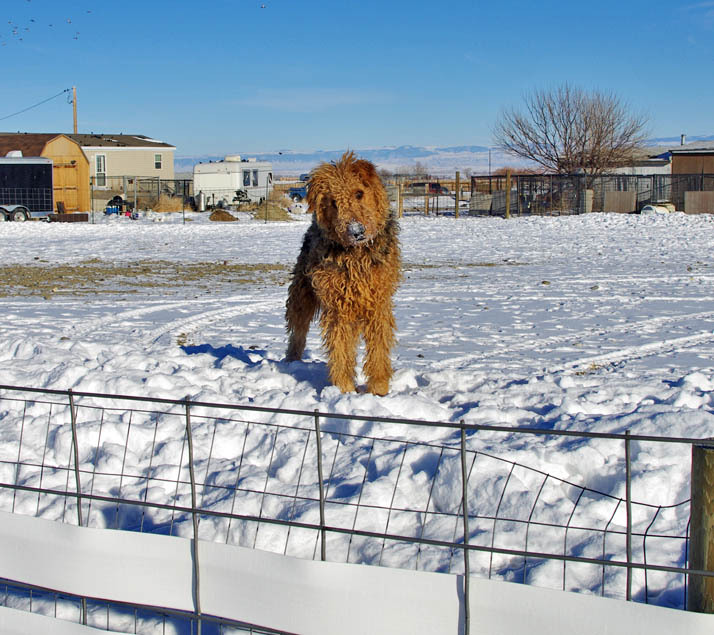 Carl has been around and owned Airedales since 1981 while Pat had them as pets, companions, and fieldcrew since early 1991. Our dogs are a major part of our lives and we are devoted to their care. 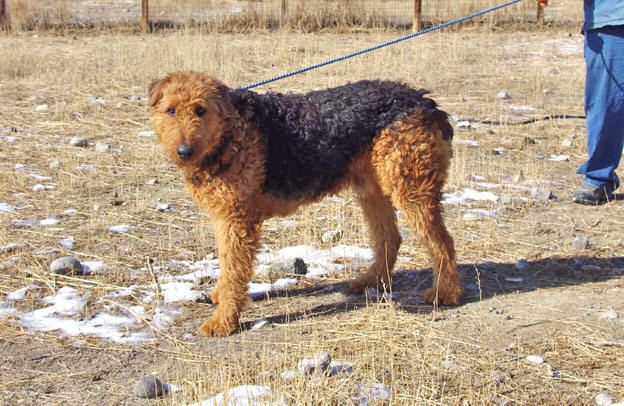 We have been breeding Airedales for over 16 years. Our clients are encouraged to contact us with any questionsconcerning their pups and later on adult dogs. We love receiving photos and updates on the pups as they grow up. For more information on growth rate, coat types, social interaction, airline shipping, etc, please see Frequently Asked Questions. 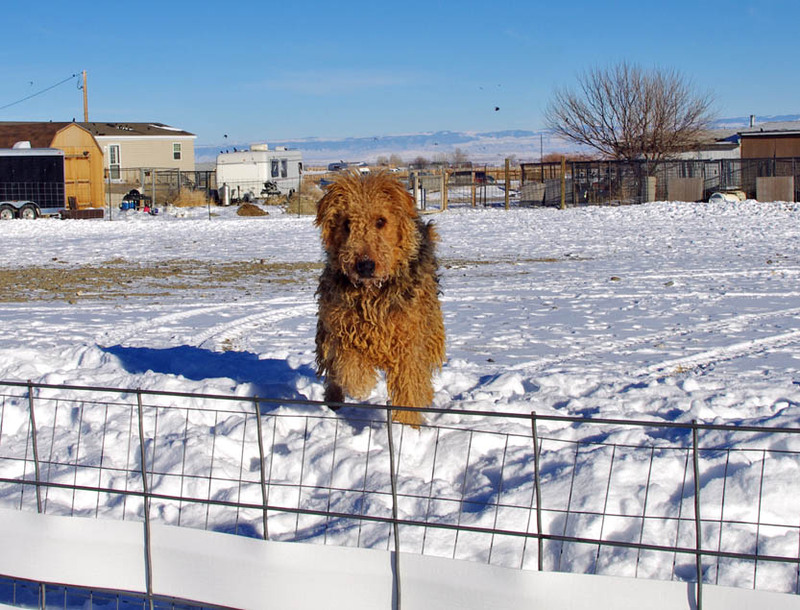 In addition to loyal companions and loving family pets (and good obedience students), our large Airedales have served as certified therapy dogs, search and rescue, stockherding dogs, and archaeology field dogs. The multitalented breed is highly versatile and may be trained to perform almost any canine occupation. Possessing considerable stamina, they often accompany us to work in a variety of settings ranging from the badlands to rugged mountains including grizzly bear habitats in Shoshone National Forest. Our work takes us into scenic remote areas sometimes over eight miles from the nearest road or jeep trail. Please read Airedale Terriers and Fieldwork for additional discussion. 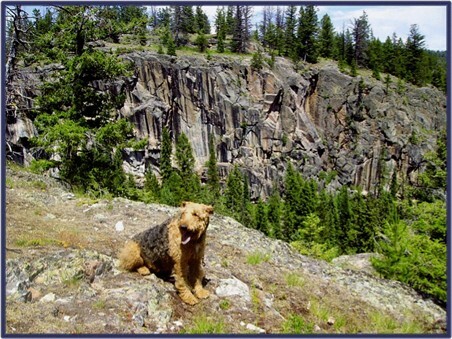 For more information on Airedale History and uses of the breed please see the Airedale Terrier History: Origins and Past/Present Uses page. Our canines are derived primarily from hardy working lines, not show lineages although several are distant descendents of Ch. Blackjack's Doubledown Danny. 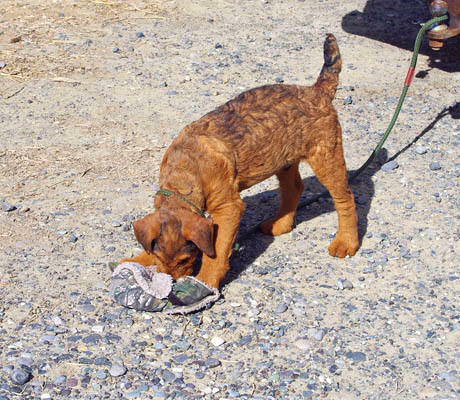 The pups are sold as pets, companions, obedience, therapy, and working dogs. 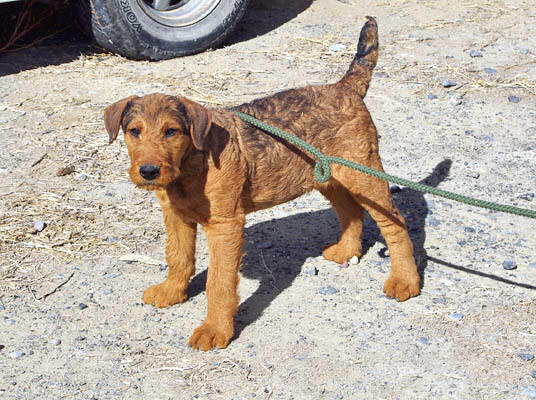 Our Airedale puppies grow into large to very large adults (60-100+ pounds) and vary in shoulder height from around 25-29 inches with occasional taller males. They are not designed to be show dogs which are much smaller. Our puppies are typically sold as pets/working dogs to loving homes with limited registration which basically means no breeding rights. Spaying or neutering may increase your dog's overall life span and reduce the potential for several types of cancer. Please feel free to give us a call at 307 754-3426 for prices and additional info concerning our dogs and puppies. No hard sales push, we promise! As a general policy, we do not provide our prices via email due to past experiences with fake names/emails generated by other Airedale breeders. We apologize for this inconvenience. References are available upon request from our puppy clients. Kennel visits are welcome to see the pups and their parents (and perhaps some older siblings and grandparents). 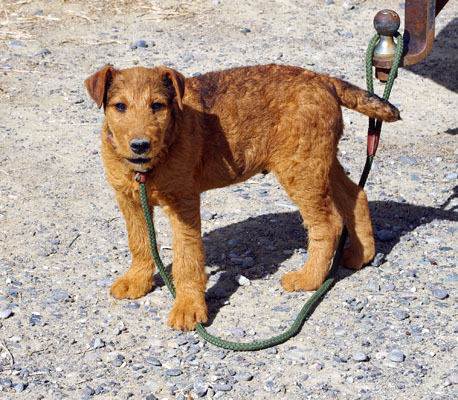 Our terriers are only bred once a year, sometimes less often. We have several females that are spayed but remain with us as pets and working companions. HK Sandhills Ranger shown above. Possessing an outgoing and affectionate disposition, he stands about 29 inches tall at the shoulder. He has a very easy to maintain coat as shown untrimmed in the pics above. 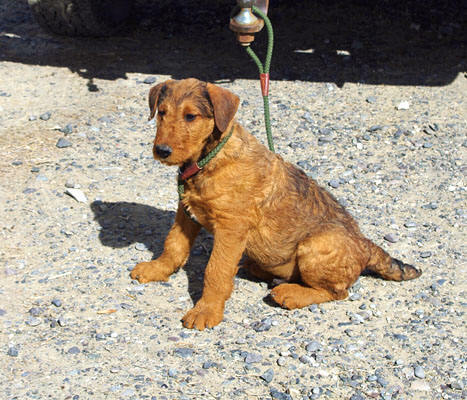 We operate a small archaeological consulting firm and our Airedales frequently accompany us into the field. This often involves extensive hiking in a variety of settings including oil/gas fields, rugged badlands, and scenic mountains including grizzly bear habitats. Motorized traffic is prohibited off-road on most Forest Service lands in Wyoming. In order to access remote project areas, excursions of up to 14 miles round trip have been made through the backcountry. In good physical condition, Airedales possess considerable stamina and are adept at traversing the rougher terrain. They love hiking and outdoor activities. Quite protective, my black Airedale Mariah (photo above left) was excellent to handle in the field; Mariah would stop instantly or slow down (obeying whichever command is given) and not drag me (Pat) down steeper trails or slopes. Weighing around 65 pounds, my buddy would also help pull me uphill if needed when commanded to do so. Accustomed to encountering livestock and wildlife, she has worked with me since puppy hood in late 1999. A seasoned traveler and well behaved, Mariah was used to lengthy drives and overnight stays in motels and campers throughout Wyoming and adjacent states. 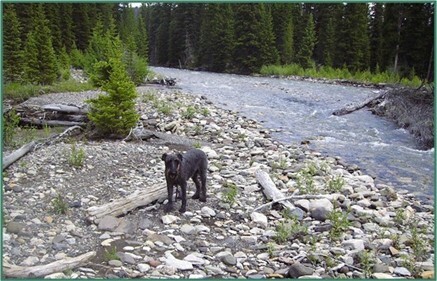 Mariah was retired from fieldwork in 2011, but remained a beloved pet and wonderful furkid. Sadly on March 17, 2015, Mariah crossed the Rainbow Bridge at the age of 15 1/2 after a very long and happy life. 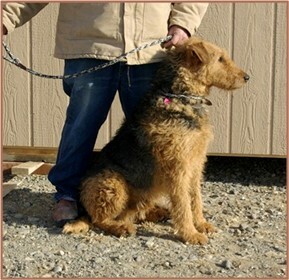 Shown on the Black Airedales page, Black Magic also accompanied me in the field for several excursions as well as his daughter, Miley, who has assumed Mariah's spot as field assistant. 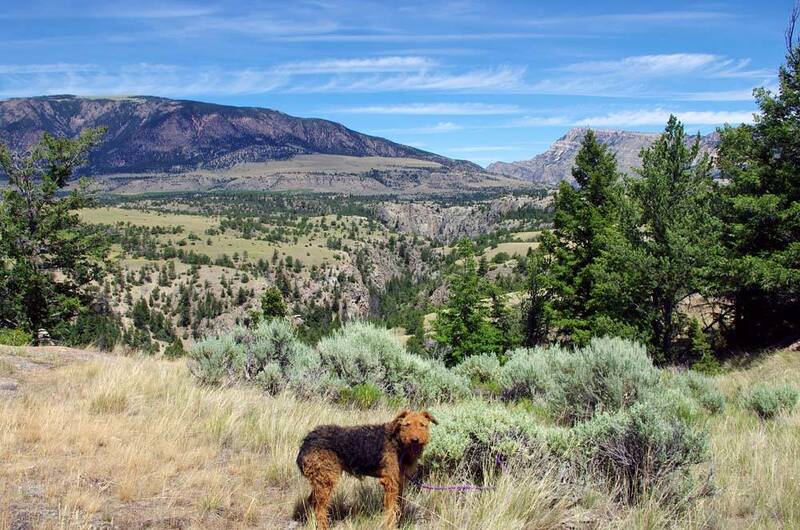 Pics below of Miley in the Absaroka Mountains northwest of Cody, Wyoming. 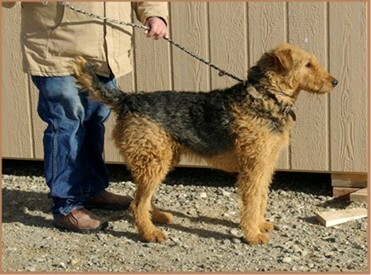 Our Airedales are purebreds, not crossed with other breeds such as Labrador or Irish Terrier, etc. to produce the red and black colorations. We have DNA proof on Roc our original black Airedale and Fancy Girl. All of our black dogs are Roc's descendents. Our field assistant, Black Magic is Roc's great-grandson. Many of the black ones exhibit some red or mahogany coloration in the beard while and the occasional small, white patch or crest on the upper chest. A few of these dogs display a faint reddish tinge on their coats. 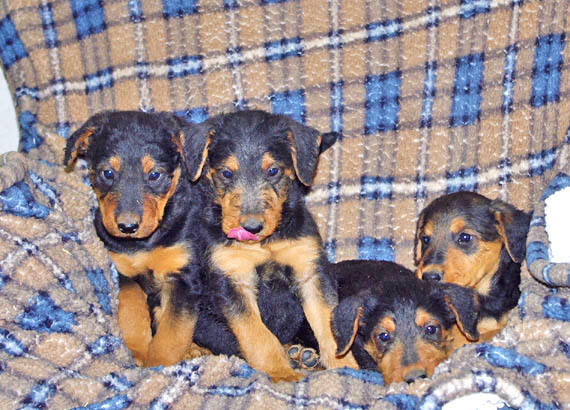 On very rare occasions, two black & tan Airedales (registered purebreds) will produce a black puppy. In the past, the breeders often either sold the black pup without papers or put the pup down trying to keep the incident a secret. 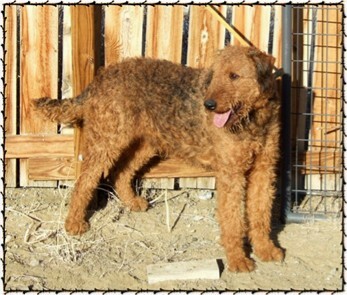 The red "Dales" (photos on Extremely Rare Red Airedales page) originated from some the oldest kennels in the US. Their red coloration ranges from a light red/tan to a deeper brownish red shade. Typically mellow in disposition, most of our red dogs possess very easy to maintain coats. 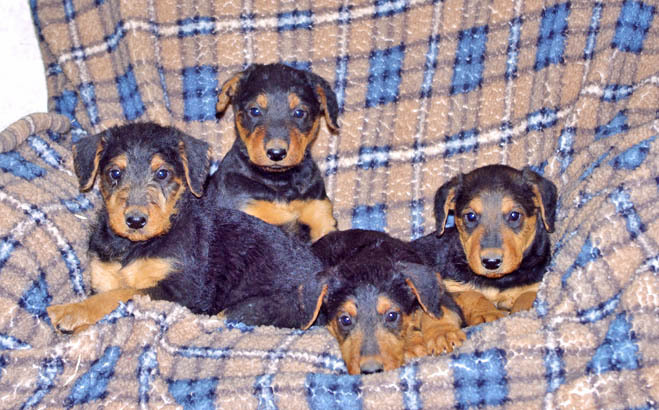 AKC will not accept the black or red Airedales on the basis of color so these dogs are registered through Continental Kennel Club (CKC) who also accepts the black and red colorations. Research documents the black Airedales' existence back to at least World War I. They were used quite efficiently as a messenger dogs - their dark coloration rendering them virtually invisible at night. 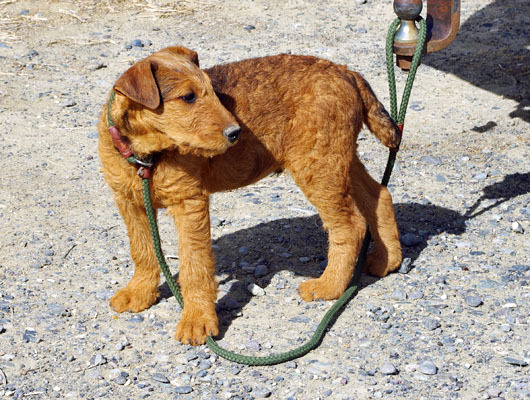 The red Airedales are exceedingly rare with less than 170 worldwide. 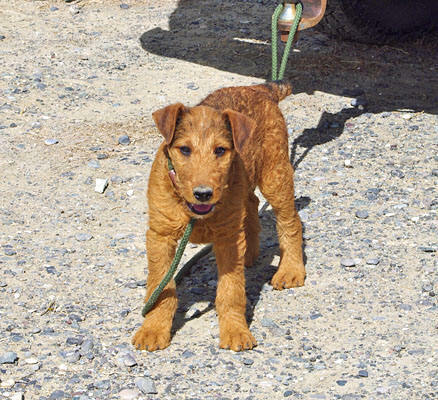 Additional photos of these dogs may be seen on the Extremely Rare Red Airedales page.